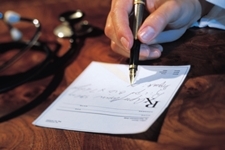 Prescribing antibiotics used to be a simple practice of choosing between two or three drugs and then administering the drug chosen for the task at hand. Now, all that has changed. A doctor has access to an amazing range of antibiotic drugs. Some of these drugs are milder, some are stronger. A few of these drugs also fall into the super-powerful category—and with this great power comes great responsibility. These powerful antibiotics have been created to kill a broad spectrum of bacteria. They are intended to be used only as a last resort, but according to a recent study, these super drugs are prescribed more than 60% of the time by doctors. What’s more, the antibiotics that kill off bacteria, good and bad, may be useless in most cases because the patients they’re being prescribed to have an infection caused by a virus. Antibiotics are supposed to be used to treat infections caused by bacteria. Some bacteria are harmless, while some are good for us. Bacteria that fall into the harmful category can cause illnesses such as tuberculosis, meningitis, syphilis, and salmonella. Usually, your immune system tries to destroy disease-causing bacteria by sending an army of white blood cells. These white blood cells attack the harmful bacteria before it even has a chance to trigger symptoms. Even if you do get some symptoms, your immune system will continue to patiently battle the bacteria until it is eradicated. Sometimes, however, harmful bacteria get the better of your immune system and antibiotics are needed to help out. Back in the day, you would have been prescribed penicillin at this point. Now, when it comes to viruses, antibiotics won’t do any good at all. Viruses are smaller than bacteria and have a different make up. They can’t survive on their own—they need a host. They reproduce by attaching themselves to other cells inside your body. Viruses reprogram your cells to make new viruses or else they turn healthy cells into malignant ones. While most bacteria don’t cause diseases, almost all viruses do. Viruses are fought with vaccines. Common viral diseases include polio, measles, chickenpox, and hepatitis A. When a doctor prescribes a powerful antibiotic to treat a virus, the danger is that patients may become needlessly antibiotic resistant. In a recent investigation, researchers found that 62 million broad-spectrum antibiotics and 39 million narrow-spectrum antibiotics were prescribed during the course of one year. Every time an antibiotic is prescribed, harmful bacteria have a chance to evolve and learn how to outsmart that antibiotic. When you add in the fact that powerful antibiotics are being used to treat some of the more simple bacterial infections, you create a dangerous situation where antibiotics may not work when you really need them too. Even powerful antibiotics may become useless in treating a serious bacterial infection. It’s important to work with your doctor to determine whether or not you actually need an antibiotic. If you have a viral infection, antibiotics are obviously not the best choice. If you have a mild bacterial infection, it may not be necessary to take any antibiotics and certainly it shouldn’t be necessary to take a really powerful antibiotic. Preidt, R., “Many Docs Wrongly Prescribe Powerful Antibiotics: Study,” MedlinePlus web site, August 8, 2013; http://www.nlm.nih.gov/medlineplus/news/fullstory_139586.html, last accessed August 11, 2013. Shapiro, D.J., et al., “Antibiotic prescribing for adults in ambulatory care in the USA, 2007-09,” J Antimicrob Chemother. July 25, 2013.